Explanation: Fighting clouds and the glow of city lights, a young Moon shines over the western horizon of Mongolia's capital, Ulaan-Baatar. 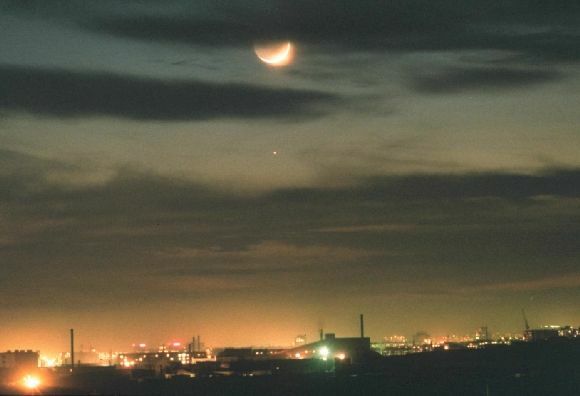 The thin sunlit crescent is about 2 days old and strongly over exposed in this image taken on March 10, 1997. The night side of the Moon is also visible due to earthshine - sunlight reflected from the Earth to the Moon. Just below the Moon, bright Saturn shines through the clouds. Skygazers will have a chance to watch the Moon actually pass in front of the ringed planet in February, March, and April this year. In fact, an excellent lunar occultation of Saturn will be visible from parts of North America on February 20th as Saturn disappears behind the dark limb of a first quarter Moon. Some may even take this opportunity to search for Saturn's lost ring.